The front of our yard will receive a layer of sod for a ready-made lawn. The rear of our lot was seeded and straw was laid over the seeds to give them protection from the wind and wildlife. If you have a keen eye, then you have most likely spotted a lawn with straw laid on top of it. Have you ever wondered why people put straw over a lawn that needs to look as welcoming as possible? The truth is that no matter how unattractive the entire set-up looks, this act of "strawing" a front lawn is actually an important procedure for the proper growth of grass. Landscapers are well aware that in order for grass to grow without problems, one must have the following items at their disposal: grass seeds, a rake, rollers, a hose, stakes and strings. What most people are not aware of is that there is another thing needed, which is mulch. 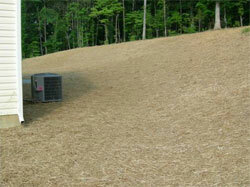 Mulch is defined as a covering that protects the rotting of any plant life on the soil. It also has the ability to reduce the risks of erosion and other evaporative aspects of the soil. Landscapers, however, opt to use straws for very large areas of grass. Depending on the density and size of the grass, the straw covering might reach up to about 500 to 1,000 square feet. Most people see straw as optional, but the material is essential to keep the area moist in preparation for germination. The use of straw can also be highly economical. It is cheaper than using mulch or manure. To do this, landscapers simply spread the straw over the area in a loose manner. The entire process is more focused on the shading rather than moisture holding, so they see to it that the straw does not have to cover all parts of the soil. Properly placed straw over a lawn will not choke the grass. Once the grass begins to germinate, it will start to grow. During this process, the grass will break through the straw. The straw must be removed once the grass seedlings begin to sprout and push the straw upwards. Begin cleaning the straw by mowing the lawn for the first time, the lawn mower will chop up the straw into small bits that will mix with pieces of mowed grass. Rake any excess clumps lightly off the lawn. Take note that with straw laid on top of it, a lawn should be watered in the morning, and again at night between the hours of 5PM and 8PM. At this point, do not allow small pools of water to collect in small areas in order to avoid problems of saturation. Not everyone prefers to use straw, as they claim that the straw might contain weed seeds that may mix in with the grass seeds and disrupt the process of germination. This might be true in certain circumstances, but more experienced landscapers have developed an eye to select bedding straws, wheat, oak, or even barley instead of real hay, which contains seed heads that prove dangerous for the growth of the grass. Experienced landscapers must also develop an eye to select the cleanest of straws and those that have a 3-straw thickness rating. Of course, if straw is not available in your area, there are manufactured mulches that are sold in various centers that focus on gardening materials. Specific products of this kind are Penn Mulch, a hydro seed and one of the best-selling mulches on the market. It is important, however, to follow the instructions as written on the package, since many manufactured mulches have different application processes. When planting grass, make sure to have the appropriate materials necessary, the right seed for your area and soil, and the correct straw to protect your seed and help it germinate. With a little patience, your lawn should be beautiful before you know it!